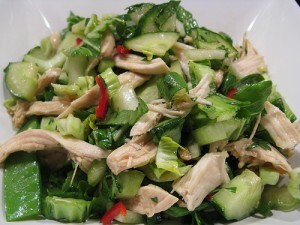 Chicken Salad recipe by Mariam at DesiRecipes.com. Boil and shred the chicken . Blanch the tomatoes and cube them. Finley chop the onion and chilli. Peel and finely chop the cucumber. Keep aside for 10 minutes before serving to let the flavours blend together.